I have been busy this week with this sweet mini quilt... There are 160 flying geese there! It's a swarm of geese! The Fat Quarter Shop is hosting a March Minis Challenge (play-on March Madness). They are challenging everyone to create and share their mini quilt projects with us ALL March long starting MARCH 9th – MARCH 31st on Facebook, Twitter, and Instagram using #marchminis. Oh and they are having the SMALLEST GIVEAWAY ever too? Technically, the giveaway is not small at all, but it is filled with their favorite small things including patterns, notions, and precuts. The wonderful people at the Fat Quarter Shop are also sponsoring a mini giveaway for my readers too. Woohoo! 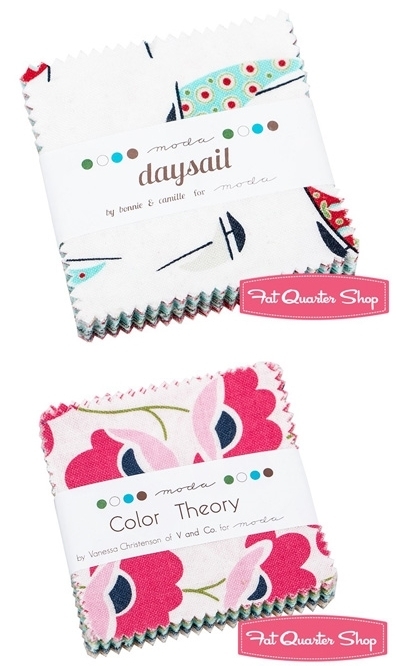 This giveaway is for two mini charm packs, one Daysail MINI Charm Pack by Bonnie & Camille for Moda Fabrics and one Color Theory MINI Charm Pack by V & Co. for Moda Fabrics. Just leave a comment below to be entered into the two mini charm packs giveaway. The giveaway will be open through next Tuesday, March 31, 5 PM PST. 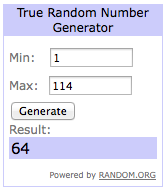 I will draw one random winner using a random number generator. Don't forget to leave a way that I can contact you in your comment. Good luck! Congratulations #64, Dannette! Enjoy your new mini charm packs! Oooh!! I love your quilt! Great name!!! Please put my name in the hat for mini charm squares... They have to be the sweetest things around!! Wow that's a lot of flying geese and they sure make a fabulous quilt. Ooooh those geese are perfect! Do you have a tutorial for them? Thanks for the chance to win. I love both lines of fabric. Your Flying Geese mini is adorable! You did a great job! Thanks for the chance to win the mini charm packs-both collections have great prints! and both are so cheery and colorful for spring! Very nice. It's fun seeing the projects in this challenge. Love your mini....tiny flying geese are tricky! Your quilt is beautiful. Thank you for the chance to win the lovely mini charm packs. Your mini quilt is lovely! I love flying geese. I love the way your flying geese go in many directions. Love Love Loooove your Quilt!!! AWESOME!! Love those flying geese! Thanks for a chance to win. Cute quilt. It is hard to see it as amini until you notice the clips. Those must be tiny pieces. thanks for sharing. I love Charm packs. I would take good care of them! I have the perfect pattern to make purses out of charm packs. I love your mini. I wish I had the mental space to make one or two. Your geese are so cute! And those mini charms looks fun. I am an english paper piecing addict and charm packs are perfect for them! What a great mini...thanks for sharing! I love flying geese! Your mini is so cute! I love these mini-charms. They are so easy to sew together and make the nicest quilts. Thanks for the chance to win. Love those geese!! Thanks for the giveaway! I love your sweet mini, I know it can be difficult to work on something so small! You've made it look easy. Thanks for sharing! Great job on all those Geese whew! great giveaway thanks. Lovely geese and great fabrics! What a fun challenge. Your quilt is lovely, you've done a great job on your geese. Your quilt is beautiful. I submitted 3 mini's for the March Mini Challenge . Thank you for the giveaway. Your gaggle of swarming geese are lovely. Thanks for the change to win. I LOVE mini charm packs! Who knew they could be used for so many things!!! Thank you for the giveaway! Your quilt is lovely! So are you for having a giveaway. thank you! Mini charms are such fun! Your quilt is gorgeous. I haven't worked with triangles in quilts yet. I'm still sort of a newbie. I love both lines of fabric you have for the mini charms. However, I haven''t had a chance to work with them. This would be a fun giveaway to win. powersjlc (at) gmail (dot) com Thank you so much for the chance. Love the name you've picked for the quilt!! Beautiful. All those tiny geese! AMAZING. Your quilt is beautiful! You are very talented. Thanks! I would love to win these bundles! Thanks! What a great mini! Thanks for the chance to win too. 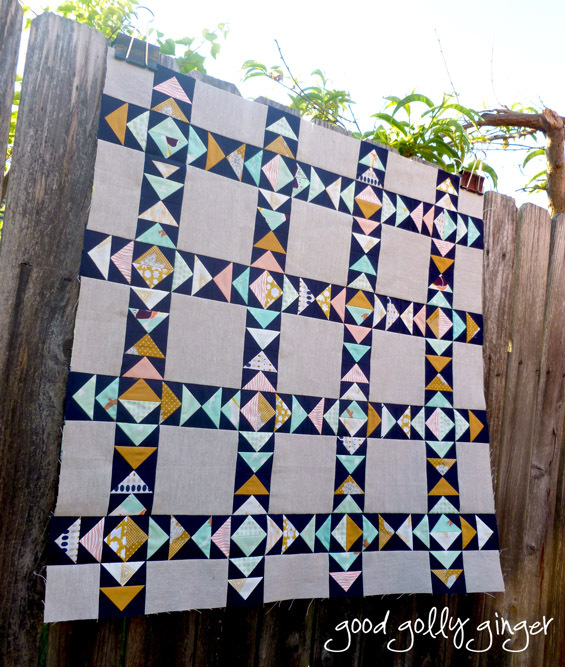 A flying geese quilt us on my Quilty bucket list. I like the navy! I bought some yardage of navy awhile ago and can't find it! Ack!! how generous.. such a lovely quilt, all those perfect points! Very nice quilt. What are the dimensions? Or, what are the finished size of your flying geese. I am just trying to get some perspective as the picture makes it look huge. Love the colors in the quilt. I have only recently gotten over my phobia of flying geese, but I still don't trust them. Back in November 2013, when I had only been sewing a few months, I started working on a Flower Patch (by Green Fairy) quilt that uses a lot of flying geese. After stitching the 136 geese for the outer flower petals and four of the inner petals.... I didn't touch the quilt or flying geese again until a few weeks ago! Now I am determined this is my year to finish my all UFOs, so I picked this one up again and am finally done with all the geese in the quilt. Your mini is awesome with all those geese! I love you mini - flying geese just might be my favorite - it's definitely in my top five! I've always been a little hesitant about these tiny mini charms - what can you make with them, after all? But I've seen so many cute minis lately made from these mini charms! I think I'm ready to jump on board and make my disperse mini! I love the minis! So cute! I love your mini! Thanks for the chance to win! i love minis of all kind and these fabric lines are gorgeous. Love your geese quilt. Those minis are so much fun. I saw the mini quilts at the fat quarter shop, so cute. Love it! There have been a ton of flying geese in blogland lately, from teeny tiny to giant and I LOVE them all! Thanks for a chance to win some yummy fabric! Your mini quilt is beautiful. Thanks for sharing. 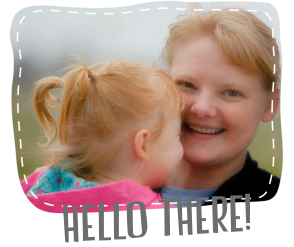 Your mini quilt is darling! I'm addicted to the mini charms probably because I love trying new things and mini's are a great benefit to that. The smallest precut I ever used was 5" charm squares. Would love to try out the mini charm packs to make a mini quilt or two. That is a swarm of geese and a beautiful quilt. Thanks to all for a great giveaway. Someone is going to be extremely happy. Cute quilt, but that huge flock of geese, oh my. Love the mini charm packs for + quilts. I love your work! This quilt and all your others! Thanks for the giveaway. Love flying geese in quilts. Yours look super! Beautiful mini. What is the finished size of your quilt? Of your flying geese? I love this quilt! There are so many fun projects using charm squares. I love your swarm of geese! I love mimi quilts and yours is fabulous. That is a boatload of flying geese! Your quilt is really cool. I do like a flying goose. Lovely quilt, thank you for the giveaway. When I saw your quilt, I could almost hear the geese flapping their wings and squawking! A swarm of 160 indeed! It looks wonderful! Thanks for the opportunity and great blog! Your quilt is very inspiring. Excellent quilt. Great color choices. I haven't made a quilt with flying geese yet - this may be the one! Really cute mini quilt! I admire your patience in making such tiny and pretty flying geese! Your flying geese mini coincided with nature. Lately, I have seen lots of flying geese returning North. Love your mini quilt, and the quilting on it. Your mini is just lovely! Thanks for sharing. That is a lot of geese! i love flying geese and your quilt is beautiful. Flying geese are spot on for Spring & so is your mini! I love your flying geese.....mine always look like they have just flown through a tornado! I love minis! I am collecting them for use in a big project! You have such perfect flying geese, what method do you use? Fab quilt and the mini charms look great. I would love to win something... I never won anything!!! would be VeRy HaPpY. What a sweet quilt! I love the contrast. Your flying geese are Perfect!!! Pretty quilt and charm packs! !